Do you want your child to reconnect with their Polish origins? Do you want to pull your child away from the tablet or a smartphone and get them physically active? Do you want your child to gain confidence and learn how to be and play with other children? Polish Folk Dance Group Koniczyna was established in October 2009 supported by Dominican Polish Chaplaincy in Dublin. Koniczyna consists of approx. 35 members at various ages and levels of dance skills (from professional dancers to beginners). The group’s program includes national, regional dances and selected regional folk songs. We are proud ambassadors of Poland’s native folklore on the Emerald Island and we promote the richness of Polish culture to all nationalities. 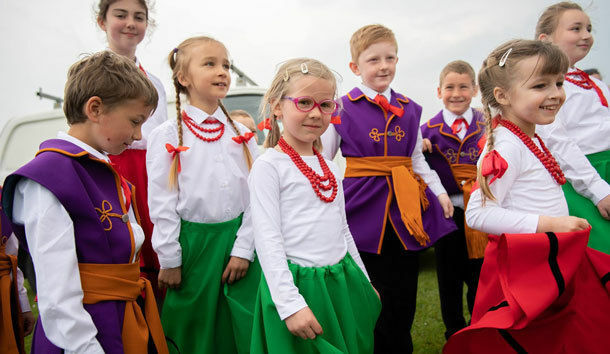 Our unique Polish folk dance group in Ireland recently created a Junior section to share the beauty of traditional Polish dances with younger generations. We are now encouraging children and teenagers (aged 4-12) to join the Junior section of our dance group to learn about their native culture and to make life-long friendships.